Great to be working in partnership with Central Bedfordshire Council and JustPark. 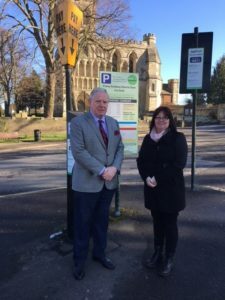 For each transaction made through JustPark in 8 carparks across Central Bedfordshire if a driver texts or calls to pay, if they opt in to receive SMS messages, 5p will be donated to the Road Victims Trust. RVT Ambassador, Kate Goldsmith is pictured with Cllr Budge Wells, Deputy Executive Member for Community Services at CBC. Kate said, “This is a lovely gesture by CBC and Just Park that will help a wonderful charity that has done so much to support me”.